While the Meiji period is dated from the ascendance to the Japanese throne of Emperor Meiji in 1868, the broader sweep of history would suggest looking a few years further back to 1853 when Commodore Perry’s first expedition opened a wedge into the previously highly insular Japanese kingdom. The United States’ motivation was economic and, under threat of U.S. military attack, a treaty was negotiated in 1854 which, in effect, ended two centuries of Japanese isolationism and started a significant transformation of Japan, both economically and culturally. At that time, photography was still, for all practical purposes, in its infancy and had not yet become a medium for mass communication. In Japan, woodblock prints, often produced in editions as large as 100,000, and sold inexpensively, were an important means of communicating current happenings to a broad public–sort of the Life Magazine or the CNN of an earlier century. As such, the prints provide fascinating glimpses into the history of the time, and, as well, into the evolving aesthetic of the form. The current exhibition of some 70 of these prints from the Sharf collection has been drawn from an earlier show at the Boston Museum of Fine Arts. Curated at The Presidio by historian Randolph Delehanty, the emphasis is on the ways that developing events were reflected in both the subject matter and the style of the prints, culminating in a final look at the significant Japanese presence at the The Panama Pacific International Exposition –San Francisco’s 1915 World’s Fair. The exhibit could not be more appropriate to this location. A welcome added element is a display case in which is demonstrated the step-by-step making of a woodblock print. The earlier prints have a traditional Japanese look, with their flat perspectives and richness of complex patterning. Even at this early date, international influences are present–the aniline printing dyes used were imported from Germany and explain the deep colors, including a dark wine/red strongly evident in many of the prints. In subject matter, changes, both social and technological, are evident. The Emperor (see left) pictured with wife and son, rather than traditionally with concubines, reflects the adoption of the Western model of the nuclear family, as the Emperor’s naval uniform and the Empress’ fashionable dress and hat reflect Western styles. A print called "Maple Leaves at the New Palace" combines the old and the new; the palace was built in Tokyo when the capital was moved from Kyoto. On the left is a traditional landscape; on the right, the emperor and members of his court are dressed in contemporary Western style. 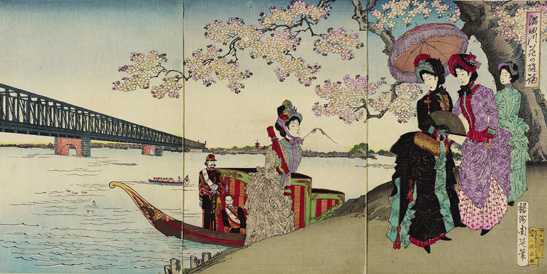 "Excursion to View the Cherry Blossoms" adds depth perspective to accommodate the technological wonder of the new bridge. There are elegantly bustled ladies along with the traditional representation of branches of cherry blossoms arching across the center. Industrial imagery appears — railroads, banks, sewing machines. And then, as Japan went to war, first with China in 1894 and a decade later with Russia, the new militarism is reflected in images of troops and maneuvers. The artists sought methods to capture action and energy as they depicted explosions and battles. Powerful diagonals are used as well as strong light/dark contrasts. Abstraction and patterning attempt to convey movement and, in doing so, the roots of Japanese comics and later anime can be seen evolving. An 1894 print of the sinking of Chinese warships is seen from underwater, the waterline up at the top quarter of the print–it has a contemporary freshness as if drawn yesterday. "Fighting the Russians at Port Arthur," a composition full of energy and movement, uses traditional patterns to represent the water, a conflux of the old and new. From the elegance and serenity of the 19th century,over a mere three or four decades, Japanese society emerges full-blown into the modernity of the 20th. The nation shifts from insularity to become an international military player, from an agriculturally based economy to an industrial powerhouse. The woodblock prints trace the story and the changes, adapting their style to the changing messages they carry. Art records history; history changes art.